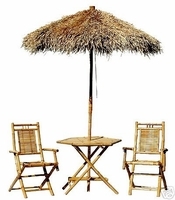 This sustainable bamboo furniture comes with round table and stand, height to top of the umbrella is 96" and the diameter of the umbrella is about 5 1/2 and the thatch is also fire retardant. A great addition to your backyard space. We have sizes 5ft- 7ft- 9ft thatched umbrellas with bamboo pole.